This is my all time favorite quote by her. I have it printed too. Such a humble reminder that I live for God alone. Love it! The perfect way to live our life! I absolutely love this quote. I've had it for over a year and love looking at it to remind myself what's really important. I'm so glad you found it and love it too! Okay Okay... 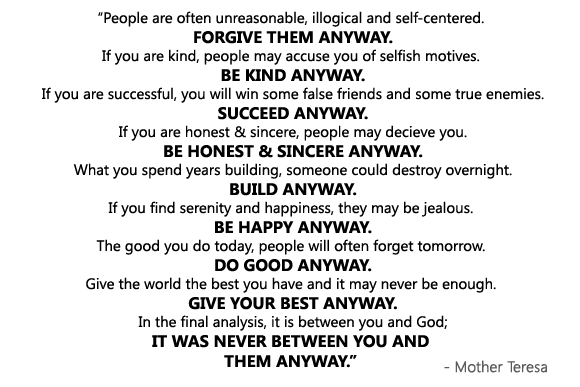 I will take Mother Teresa's advice! I was kind of being a bitter betty yesterday, ha! Love you friend! Thanks for posting these words of encouragement! Btw, what you said to me yesterday has stuck with me.... "Life is Good" It sure is! :) xo! Chills! The one that really got me was "What you spend years building, someone could destroy overnight-- build anyway." Very applicable to something that's happened to us recently. Love. Lindsay, what a great post!! I need to print this out -- it is such a great reminder! Words to live by. Love it! Just wonderful! What a great way to start your day! I am speechless. What a beautiful quote, one i will live by!!!!! Thank you!